Sheet music of Akher Iyyam el-Sayfiyi آخر إيام الصيفية of Fairouz. Written and composed by Rahbani Brothers. You get two sheet music files, one transcribed on C minor and another on B minor which was the original key of the studio recording of the song. 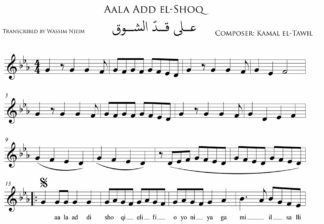 The files include the lyrics in Arabic as well as English transliteration under the score lines.